In a dusty backstreet of Goma, where cars creep past slowly over the jagged, volcanic rock on which the city is built, Lulu Castofas sits under a parasol. He wears a flat cap and a thick, black beard, peppered with grey. Around his neck hangs a green plastic crucifix, half tucked in to his white shirt. 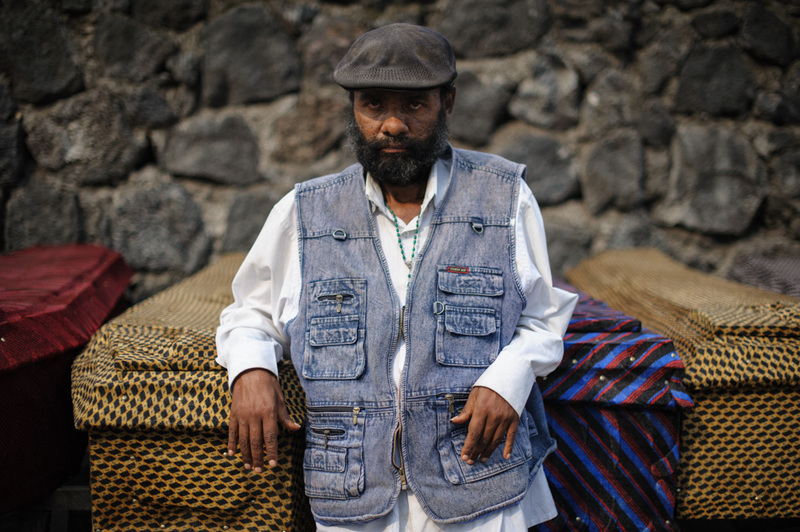 Mr. Castofas used to be a driver, but for the past three years he has been making a living from selling coffins, and right now, business is booming. In mid-July, conflict resumed just north of Goma. Depending on who you talk to, it was either the M23 rebels that fired the first shot, or the national army. Irrespective of which side of the narrowing front-line the first shell landed on, several days of heavy combat ensued. And for the first time in over a year, the army has made military advances over the rebels, pushing them back by a few kilometres from the provincial capital. Inevitably, such advances come with a price. "With their battles, they are buying a lot. Most of what I sell, it's to the army" says Mr. Castofas. The coffins that he sells are covered in patterned material, and according to the sellers on this morbid street, the vibrant decoration originated in Goma. Death is contained within a wooden box, and concealed by a choice of patterned velour, or, for a price, faux leather. From his street-side stall, where 14 adult-sized coffins are displayed on a crude wooden frame, with four haunting child-size models on the ground below, he sells on average ten a week. But, he says, "if the military come with a truck, I can sell all of them at once." The front has been quiet in recent weeks, but army commanders say they expect "the order" soon. "Within 48 hours, it will begin" is the line I have been told repeatedly for two weeks now, my confidence in its accuracy fading with each telling. But the status quo is untenable; confidence in peace talks is waning and soon something will snap. Mr. Castofas will need to stockpile his wares.